Oh my gosh. The last two days have not been the greatest for me. 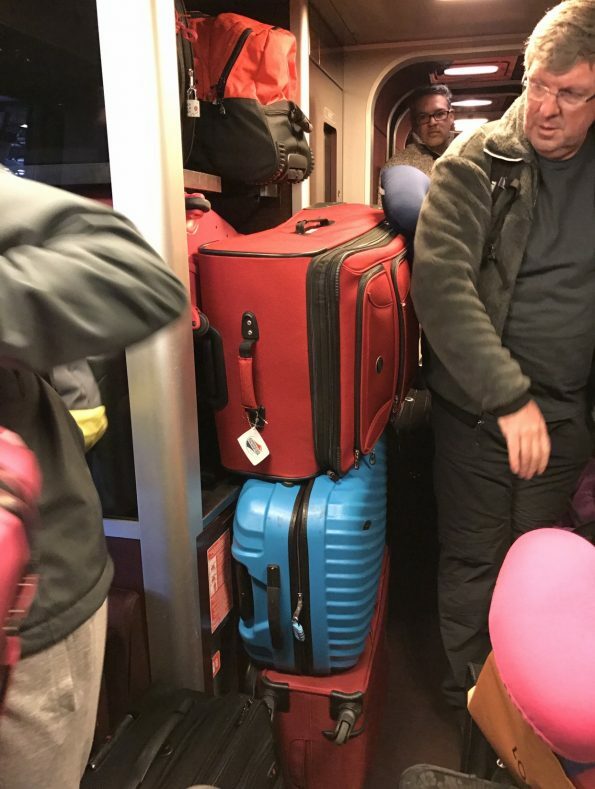 First I had a not so magical day at Disneyland Paris, and now I am in the middle of a mess to get to Amsterdam. I was really excited to travel by train, but it’s not looking so hot at the moment. I started my day by taking an Uber to the station because I didn’t want to deal with my luggage on the metro again headed to somewhere I didn’t know. 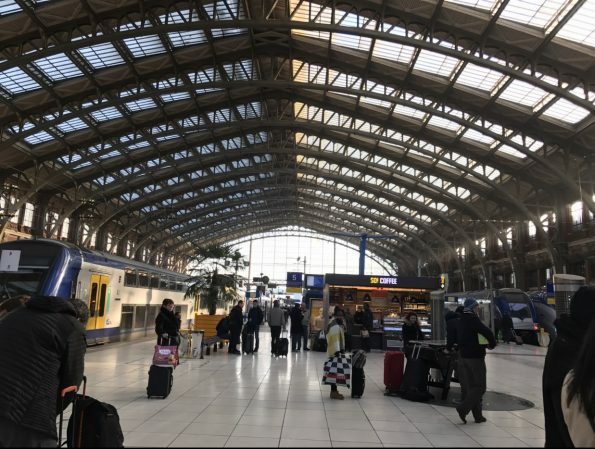 My uber driver missed where to drop me off twice, and it was at Charles-Degaul Airport TGV so it took a while to get back around. Thankfully I left early and gave myself plenty of time because I wasn’t sure what to expect on my first train ride. When I got there I had breakfast at a little pastry place. I sat by the window that looks down into where the trains and people waiting for them are located. Right when I was finishing my breakfast I saw that security had their weapons drawn, and were not letting people go downstairs. Nobody knew what was going on, but eventually everyone started coming upstairs and we were told they had found a package that could be a bomb. This was a pretty scary situation, they were evacuating and shutting down all of the shops. The police and military were coming in groups to go downstairs. After about 40 minutes everything was back to normal again and the trains started running, so I found my way to my seat. Luckily the scare ended right on time for my train to depart at the scheduled time. The first leg of the journey was good, and then we got to a train station, and the train just went black. All of the lights tuned off, and someone came over the speaker saying something rather lengthily in French. I don’t know any French expect for bonjour and merci, so I had to ask the guy next to me what was going on. He didn’t know too much English, but he said follow him and we ended up going to a completely different station that was not that close by. On our walk to the new station, we passed by a girl yelling and then running away, followed by security officers chasing her with their weapons drawn. I have no idea what she said, but my friend that I was following just said to keep going, so we did. I then went to the ticket counter and was given a new route to go on to make it to Amsterdam. As I write this I am boarded on my train to Anvers where I then have to take another train to Amsterdam, delaying me about 2 hours. But that is ok because I am lucky just to be in Europe and traveling around, and if all goes well then tonight I will be taking a canal tour of the Christmas Lights of Amsterdam! I am very excited for that! Knee Update: I woke up still in a lot of pain, but it is better than it was last night. I am keeping a lookout for a brace to have a little extra support since I’m just beginning my traveling around Europe. 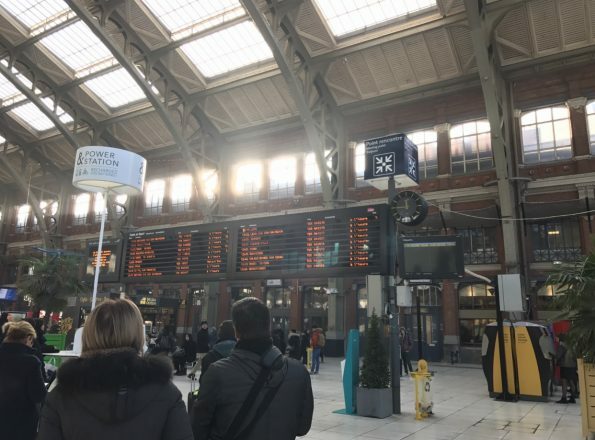 Update to my train travels: The train to Anvers is also having issues, so I took a different train to Brussels, where I then found out that ALL trains to Amsterdam were cancelled. My train to Brussels took me through Beliguim, and it is gorgeous! If I had to be delayed this way, this is the route to go. I also met a nice local, Xavier, who made sure I was getting to where I needed until his stop in Brussels. Eventually my train to Amsterdam came, but about 2 minutes after it departed there was an announcement saying it was not headed for Amsterdam, but Rotterdam. I almost freaked out because this was getting a little ridiculous. I looked up trains for Amsterdam from Rotterdam and ran to catch the next one right in the nick of time. I got to Amsterdam over 5 hours late, but made it just in time to drop my luggage off at my Airbnb and head to my canal light festival cruise! Yay for finally making it!